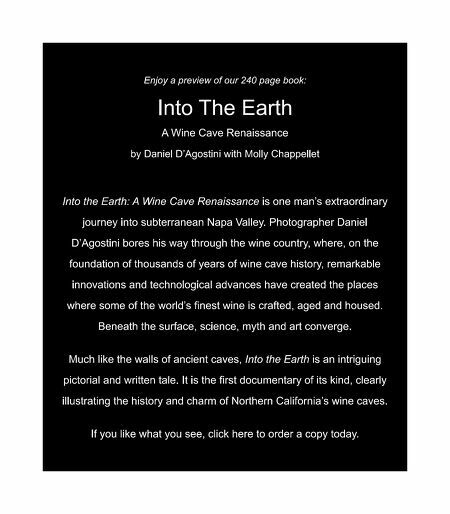 Enjoy a preview of our 240 page book: Into The Earth A Wine Cave Renaissance by Daniel D'Agostini with Molly Chappellet Into the Earth: A Wine Cave Renaissance is one man's extraordinary journey into subterranean Napa Valley. Photographer Daniel D'Agostini bores his way through the wine country, where, on the foundation of thousands of years of wine cave history, remarkable innovations and technological advances have created the places where some of the world's ﬁnest wine is crafted, aged and housed. Beneath the surface, science, myth and art converge. 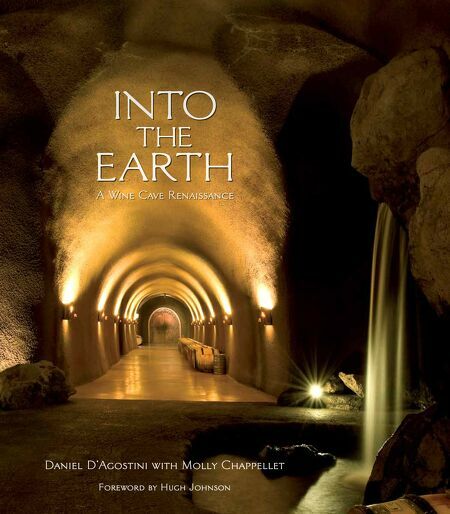 Much like the walls of ancient caves, Into the Earth is an intriguing pictorial and written tale. It is the ﬁrst documentary of its kind, clearly illustrating the history and charm of Northern California's wine caves. If you like what you see, click here to order a copy today.